Two bald eagles perch on top of a Douglas ﬁr tree above the Youth Center. editor’s NOTE Living In Integrity Think about a person you know who always arrives on time. Do you wonder how he or she does it? How is it that they never slip up? Is it because they’re organized? Partly so, but it’s mostly because they live in integrity. This person would tell you openly if they had other obligations because they honor and value your time as well as their own. This person would not allow the unsettling feelings to take place in their heart, simply because it does not follow the ethics they believe in. To live in integrity is to say what you mean as well as do what you say you will do. Let’s put it this way: integrity means doing the right thing, even when no one is looking. It is a characteristic you may notice even more when someone doesn’t actually have it. SWINOMISH COMMUNICATIONS Heather Mills, Communications Manager | hmills@swinomish.nsn.us Emma Fox, Communications Specialist | efox@swinomish.nsn.us ADVISORY COMMITTEE Allan Olson, Tracy James, Kevin Paul This issue is available online at swinomish-nsn.gov/qyuuqs Photos credits: qyuuqs News Staff or as credited. All rights reserved. Facebook: Swinomish qyuuqs News Linkedin: Swinomish Indian Tribal Community *qyuuqs News is made available for viewing on the Internet When submitting information, stories, and/or photos, please be aware everything published in the print version of qyuuqs News is also published on the Internet and is available to the world. Please consider carefully whether your submissions contain anything you feel may not be suitable or appropriate for the Internet. By submitting your information, stories, and/or photos to qyuuqs News, you agree to publishing your submission in both the print and online versions of qyuuqs News. 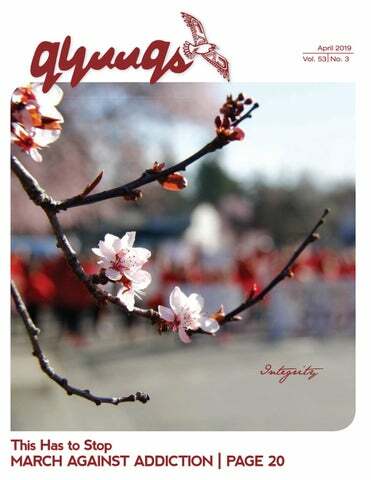 qyuuqs News is a publication of the Swinomish Indian Tribal Community produced by Swinomish Communications. NEW Driver’s Relicensing Program at the Swinomish TERO Office! Is your driver’s license suspended or revoked? Do you have fines and fees holding up your license? We have great news for you — the Swinomish Tribe partnered with Northwest Justice Project to offer a driver relicensing program! The new program offers free legal help from an attorney who is familiar with the court system and can negotiate fines and fees, and hopefully get your license back. You do not even have to know where all of your tickets are because the program’s legal team can find out for you. All you need to do to jump on this great opportunity is to fill out an application at the Swinomish TERO office at 11373 Moorage Way. You may even qualify for additional financial assistance in paying off some of your fees. APRIL 21 Happy Easter! APRIL 22 Happy Earth Day! Space is limited so sign up now! Call Rachel Phair at the TERO office at (360) 466.7232 with your questions. Donald Damien Jr. passed away on February 20, 2019 at Skagit Valley Hospital. Donald was born to Donald Damien Sr. and Kathryn (James) Jack on August 5, 1939. Donald was a man of humbleness, kindness and love for all those that were a part of his life. He raised his 5 children; teaching them the meaning of hard work, taking care of one another and being together. He loved and cherished his grandchildren; he lived every day for them. In his younger years Donald completed hi GED and went on to become a logger. He traveled to Aberdeen, WA; Sitka, Alaska and California during his logging career. Donald was also a commercial fisherman, auto mechanic and he mainly worked as a prison guard for Monroe Correctional Institute for many years. He was a canoe puller when he resided in Malahat B.C, he enjoyed everything about cars, mechanics, all different models and especially purchasing them whenever he could. He also liked to watch WWF wrestling and his favorite baseball team was the Seattle Mariners, he rarely missed their games. He would have the whole house yelling for the Seattle Mariners. These are going to be the most cherished memories of Donald! He always made certain to share his stories with his children and grandchildren, he wanted them to know their family history and who their relatives are. Annette Nadine Clark passed away peacefully at Mira Vista Care Center on March 18, 2019. Nadine was born on December 31, 1961 to Charles Clark Sr. and Edythe (Bailey) Clark in Tacoma, WA. Nadine attended school in Arlington, Oregon. She received her Associates of Arts Degree from Northwest Indian College. In the beginning of dealing with her health issues Nadine was 4 credits from receiving her Bachelors Degree. Being a single mother of 4 kids she wanted nothing more then to be that example for them. Nadine worked for the Swinomish Bingo, Swinomish Head Start, Swinomish Culture Department, Care giver for Franny Sylvester and she was a Commercial Fisherwoman on the Colombia River. She became a member of the Swinomish Smokehouse in 1982. Nadine love to play Stick Game, she traveled all over the Northwest, playing with her children and they won a few tournaments, which made Nadine so proud. Nadine loved her grandchildren, she lived every day of these past few years just for them. Everyone who really knows Donald knows how much he loved pretty women. When he was able to, he would make the kids drive him to the "Foxy Lady" barista for "a cup of coffee"...lol...Donald enjoyed what he enjoyed!! His favorite place to eat was the Net Drive-In on Memorial highway. He would eat there every day if he could. Donald enjoyed going to the annual Stommish Festival. He also loved spending time at Washington State Park, Sunset beach and one time he even escaped the hospital right after having surgery just so he could go sit at Snee-oosh beach. Sometimes he just wanted to go on long drives with his family to create good memories. Nadine is proceeded in death by her paternal grandparents Elden and Alma Clark, maternal grandparents Henry and Myrtle Bailey. Her dad Charles Clark Sr. and brother Charles Clark Jr. Nadine is survived by her mom Edythe Clark, children Susan (Brent) Bobb, Nick (Ayla) Clark, Leila Clark (Gerald Heyes) and Mariah Clark (Domonique Myles). Siblings Yvette James, Charlene Clark, Kim Edwards, Walter Clark Sr., Monica Clark, Cedric Clark and Wynette Gouliver. Grandkids Jaydin, Brent Jr., Duron and Princess Ellen. Many cousins, nieces, nephews and friends. Thank you for all the prayers and love. Industry Erectors Inc. carefully positions the Swinomish totem pole over its iconic footprint. LA CONNER 4TH AND 5TH GRADE BASKETBALL "This was an amazing group of boys to coach! They put their all into every practice and game to get better. This was my ﬁrst year coaching and I absolutely loved every minute of it! I couldn’t be more proud of these boys. Hard work deﬁnitely paid off! We came up a little short in the end and placed second in our league tournament, but we will be back next year!" Second place ﬁnish for this 4th/5th grade team at the League SWISH Basketball Tournament. The team is coached by Budda Luna and Nakiya Edwards. FEBRUARY 25-MARCH 1 â&#x20AC;&#x201D; Seven students braved sub-zero temperatures while cross-country skiing and camping in deep snow! Boyce Charles, Steven Hulbert, Arjuna Adams, Jahrel Cayou, Ace Baker, Cory Baker, and Garrett Brown, myself, and co-leader Matt Tiscornia engaged this chilly adventure. During the trip we discussed various topics including leadership, the value of encouragement, and goal setting. We would all like to thank the Swinomish Senate for making this trip possible! How to be in integrity: • Keep your word. Renegotiate but never go back on your word. • Be honest. Speak the truth in all honesty. • Be deliberate with the words you tell yourself and others. Your words have power and meaning to you as well as others. If you are unsure about what the right choice is, ask yourself: 1. If my choice was out there for the whole world to see, would I feel okay about it? 2. If I make this choice, will I feel okay with myself afterwards? Integrity is a highly valued trait, especially in leaders. Do you walk your talk? How good are you at your word? While no one is perfect, keeping your word is important. Discovering integrity within yourself will help you see integrity in others. Many of us have to make decisions that define who we are and what we believe in. Living in integrity means that we never have to spend time or energy questioning ourselves. LEGAL SERVICES Wills and Estate Planning for Swinomish Tribal members and spouses You SHOULD have a will and estate plan if: 1. You have or may inherit tribal trust property or any real property. 2. You have children or dependents. 3. You are over the age of 55. 4. You want to have control over the distribution of your property. Well Wishes On Your Retirement FEBRUARY 22 –– A retirement celebration in honor of Jim Gibson, John Petrich, and Merril Burke was held at the Wa Walton Center at the Swinomish Casino & Lodge. Combined, these three individuals provided 96 years of service to the Swinomish Tribe. We wish you the best of health and happiness in your retirements! John Petrich started working for the Swinomish Housing Authority in 1980. He left his position to attend Harvard in 1987 where he earned a master’s degree. He returned to Swinomish in 1989 to serve for the next 36 years as the executive director of the Swinomish Housing Authority. Merril Burke started working for the Swinomish Accounting Department in 1998 where he served as the Tribe’s chief ﬁnancial ofﬁcer for 20 years. As of November 2018, the national Centers for Disease Control and Prevention show that drug overdoses killed more than 70,000 Americans in 2017, a record. The opioid epidemic is spreading geographically across the nation. The trends in overdose deaths vary widely across the country. Several states and cities have embarked on ambitious public health programs to reduce the deadliness of drug use and connect more drug users with treatment. The Swinomish Tribe took initiative opening the Wellness Center in the winter of 2017. The center now serves the facility's maximum of 250 people for treatment six days a week and plan on expanding the facility. The Tribe also has the Swinomish Wellness Program to treat individuals living in the community who are battling with addiction. Community Voices: Being Clean and Sober In recognition of those traveling the road of recovery, qyuuqs News invited the community to share what they enjoy most about being clean and sober at the This has to Stop March Against Addiction dinner. Here is what these inspiring folks had to say: “My family again!! My relationship with God and Creator!! Being FREE!” –Chareese E. “Getting to enjoy my family again.” –Lashara S.
“Dano, Sally, and Kaitlyn.” –MJ S.
“I’m most happy that I get to give my daughters a childhood I never had.” –Ariel L.
"We can go to the park ♥" –Tori W.
“Not doing drugs and my family.” –Tre B. “I enjoy my precious time with my family and friends.” –Sally W.
“Not having to deal with the drama.” – Daniel R.
“Laugh and play.” –Heidi W.
“Thank you for being there [to] learn to live one day at a time! I will be 10 years of AA 3-22-09.” –Donna H.
“Breaking the cycle of trauma in the community one generation at a time. I am third generation in recovery from addiction. My dream is that it stops here with me for my family.” –Tony C.
“I am happy today, I choose to be happy today.” –Anonymous “I enjoy being clean and sober. I have one year clean, 27 years sober. I get to see my granddaughter every day and I am holding a job at our casino.” –Marlene S. “I love all my family time and would not change it for the world. Proud Grandma, Mom, Sister.” –Janet W. “Being aware of how wonderful life is, not missing a moment!” –Shelly J. “Being with my kids and grandkids.” – Julie S. “I have 11 months clean and sober. Very proud of myself for sticking to [it] this time. I also love that I get to be a mom again. I get to be there for my kids when they need me.” – Lana F. “Waking up to a ‘New Day’ and thankful.” – Barb J. Integrity. When you hear the word you likely picture someone you know who has personal standards you admire. Perhaps they are honest and caring or are devoted to someone. If you really think about it, there is usually a second, deeper meaning to the word integrity — not only do you admire that person’s personal code, there is something else you admire before you willingly use the word to describe them. Integrity actually has its roots in the sciences. It evolved from the Latin word “integer,” which meant whole or complete (if you remember your math lessons, integers are whole numbers, not fractions). The same root gave us words like “integral,” meaning something that is a part of the whole (the handle is integral to the door), and “integrated,” meaning added to the larger whole (the color was integrated in to the paint). In engineering, the term integrity refers to how well something can hold up to a test of its limits. A house that remains whole after a windstorm is said to have maintained its integrity. A space capsule maintains its integrity when it reenters the atmosphere in one piece. So, when you compliment someone’s integrity you are really saying two things; you admire their personal code and you believe they have been tested and have demonstrated they will follow their code under pressure. It is a high compliment indeed. Anyone can claim to have integrity, but we don’t truly believe in someone’s integrity until they have shown that they will make the right decisions and do the right things when it matters under pressure. If you aren’t sure what to do with your leftover opioid medications, call or visit Swinomish Wellness (360) 466.1024) or ask a behavioral health provider, nurse, doctor, or pharmacist about safe opioid disposal. When millions of Chinook salmon fry leave the Skagit River, they have several decisions in front them. They can decide to continue the risky migration to the Paciﬁc Ocean or stay and rear in the nearby river delta, or move a little further and rear in the estuary before making the ocean journey. For those that rear in the estuary, their search for quality habitat and food is not limited to areas near their home river system. They can swim across Whidbey basin, which includes Skagit Bay and Possession Sound, before ﬁnding habitat that may improve their chances to return as adults. complete, and the Smokehouse dike setback is still a couple years from starting. The Stillaguamish Indian Tribe, however, has recently completed the Zisaba restoration project and plans to complete the Leque restoration project in coming years. These projects include dike breaching to allow for natural tidal action and channel formation, which is important for juvenile Chinook salmon between Port Susan and Skagit Bay. Even though the project is intended to improve Stillaguamish Chinook stocks, Skagit River Chinook utilize these areas and are the most abundant Chinook stock in these areas. Different populations of juvenile Chinook can mix in estuary systems. In the Whidbey basin is a representation of all Puget Sound Chinook stocks, and even Canadian stocks. Because juvenile Chinook salmon can disperse broadly across Whidbey basin and throughout Puget Sound, Skagit River Chinook recovery requires a broad perspective with attention to estuaries outside of the Skagit River. Skagit River System Cooperative’s Research and Salmon Recovery program continues to support the Stillaguamish Indian Tribe in assessing the effectiveness of their restoration actions on juvenile Chinook salmon and are collecting genetic information to understand stock composition within these areas. By working together we will understand how neighboring restoration actions could inﬂuence Skagit Chinook recovery. This multi-year project will highlight the importance of cooperation in recovering Chinook salmon. SRSC staff and a Stillaguamish crewmember set a fyke net to catch juvenile Chinook salmon at Zisaba prior to restoration in 2016.
person must have a HAZWOPER certification in order to aid in an emergency response effort at all. Once a problem is identified and the proper emergency response organizations are contacted, a coordinated response aims to deliver swift, aggressive, and organized efforts to protect public health and the environment. Being prepared with trained personnel who have an action plan and access to resources helps equip the Tribe in the event of an emergency. Have you ever noticed the yellow emergency oil spill response trailer parked outside the Fire District 13 station? It is stocked with boom to contain a spill, sorbents to soak up oil, and personal protective equipment. Our resources, as well as others in the area, are listed on the Worldwide Response Resource List. It’s a community effort to keep oil and other kinds of chemicals out of the environment, but the best preparedness is prevention! Marine Spill Response Corporation (MSRC) demonstrating how the Royal Tern can skim oil off the surface of the water during the HAZWOPER training. PARENTS: INTERNET PROWLING IS REAL! There are many dangers that children face online every day. Recognize the signs. If your child does not want you know what they are doing on their device, look into why that is. Act in integrity. If it doesn’t feel right and the signals are clear–– something is likely not right. February 20 — Getting involved with nature is a therapeutic and healing way to expel excess energy and improve physical health. School can be stressful sometimes and so when the weather warmed up enough Youth Spirit Program participants ventured out to Martha’s Beach to enjoy the sunshine! The CHILDWISE “Digital Lives” Report 2010 discovered that most children believe that no harm will come to them as long as they do not actually meet the stranger (Raising Children in a Digital Age). Communicate with your child and tell them how dangerous it is to interact with complete strangers on the internet. It was a new experience for some and a return visit for others, but everyone had fun exploring the beach and trails. Not only can a nature hike reduce stress, it encourages curiosity and enhances observation skills. Group hikes create bonding opportunities with friends and families as well. Try taking a hike the next time you feel a little down and out. Just make sure to listen to what your body is telling you so you do not overdo it. The Youth Spirit Center provides a safe after-school environment for youth. The center is located behind the La Conner School District office and in front of the Little Braves Club and is open Wednesday-Friday from 2:35 p.m. to 4:30 p.m. and from 11:35 a.m. to 2:30 p.m. on early school release days. The internet can be a fun and interactive space for kids, but adults need to be prepared to protect them from the many pitfalls that exist there. Interwoven Lives lists for $27.95. It is available through bookstores nationwide and direct from WSU Press at (800) 354.7360 or online at wsupress.wsu.edu. In August when the guava was beginning to ripen and become juicy and fat on the tree, this kid named Juan Tamad noticed one particular guava hanging from a branch. The guava looked like it was just right: plump, juicy, and ready for him to sink his teeth into. The most important thing for Juan Tamad at that moment was to take a bite out of this ripe and juicy guava. Juan Tamad slowly moved closer to the tree. His faithful dog Ahso told him: “The guava is just right. You should reach up and pick the guava from the branch.” Juan Tamad said, “Oh, the branch is too high for me to reach.” Juan Tamad sat down under the guava tree and looked longingly at the ripe, plump, juicy guava. Juan’s champion rooster Sunoy said, “Reach up and pick the guava from the branch so you can taste the first guava of the season.” Juan Tamad said, “Oh, but my arm is tired. I will just lay down under the guava and open my mouth — the guava will fall.” So Juan Tamad lay under the guava tree with his mouth open all day and all night until the next morning. Finally, he was so hungry for the taste of that delicious, juicy, plump guava he stood up and reached up to pick it. And to his surprise, he saw that the guava was already full of holes! “Ay yah!” he said. “The birds beat me to it!” Integrity is the act of doing what is right at the right time! *Lunch served Mon-Thurs. No take away meals until 11AM. Call (360) 466.3980 to cancel home delivery. Milk served with all meals. Protect the health of our community by safely disposing of used syringes in designated syringe disposal boxes, now located on Solahdwh Lane and behind the Swinomish Medical Clinic. Knock on the back door of the Medical Clinic for a quick, confidential supply of clean needles. I WILL GRADUATE. Spring Break 2019! 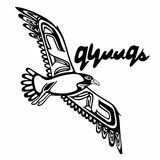 qyuuqs News is a publication of the Swinomish Indian Tribal Community.